Best of the best: More than 180 students in the Career and Technical Education (CTE) programs from OCM BOCES in Syracuse and Cortland were inducted into the National Technical Honor Society (NTHS) during ceremonies in March at their respective schools. Students who qualify must have an 85 average or higher, 12 or fewer absences from their program for the year and receive a teacher endorsement. Students must also demonstrate respect, honesty, skill, responsibility, leadership, service and citizenship. 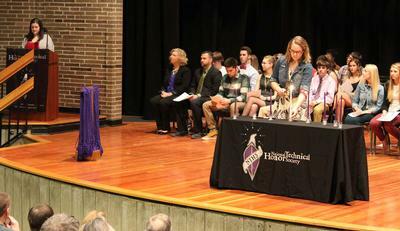 In the photo, NTHS inductee Caitlin Whiting from Marathon lights a candle in the auditorium of the McEvoy Eduction Campus while Shannon Cole from Homer reads at the podium. Both are in the culinary program. For complete lists of NTHS inductees, sorted by district, please click on the links below.